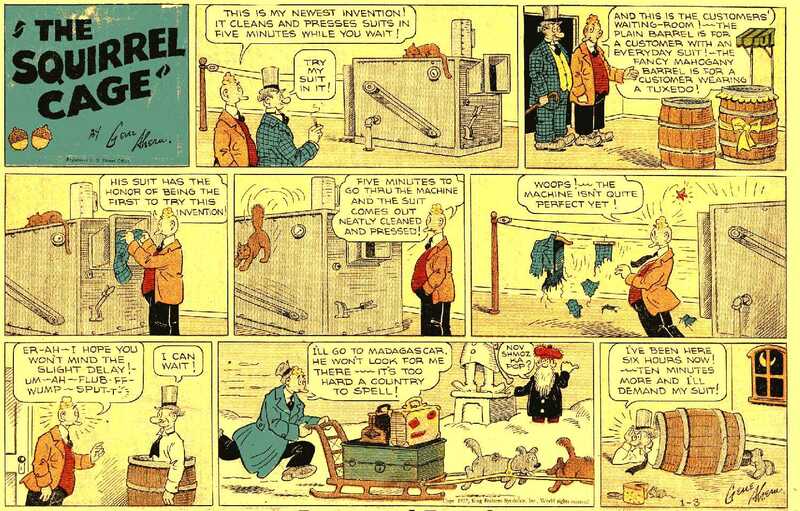 Created by Gene Ahern, who had achieved fame with his Our Boarding House, The Squirrel Cage was the topper to the Sunday edition of another great strip by Ahern, Board and Room. The Squirrel Cage displayed Ahern’s anarchic brand of humor. The main character was referred to as “The Little Hitchhiker”. He had a long white beard, wore an oversize tam on his head, and covered his body with a black smock. He later became the inspiration for Robert Crumb’s Mr. Natural. The Little Hitchhiker stood by the side of the road with his thumb extended and uttering nonsnese phrases, the most popular of which was “Nov shmoz ka pop?”. The strip died during World War II with the paper shortages and the end of the toppers. But his catch phrase still lives on. Available on Complete Inventory USB, 36 pages, including 30 Sunday strips in full color!